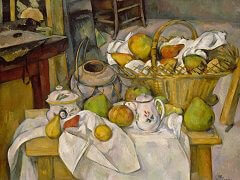 Paul Cezanne was a French artist born in Aix, in France, on January 19, 1839. Philippe Auguste, his father, had quite a successful business as the co-founder of a French banking firm. Hence, the artist had the luxury of attending a good school that helped enhance his skills. He was enrolled at the College Bourbon, and this was also the place where he met another brilliant person named emile Zola. 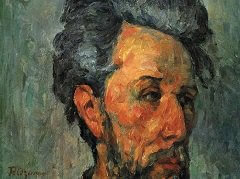 The two became friends, although Cezanne pursued painting while Zola became a great literary artist. In 1856, Cezanne took up drawing and painting lessons at the ecole des Beaux-Arts. Unfortunately, his father was against his decision of becoming an artist. Thus, to please his father, he decided to attend the University of Aix-en-Provence to take up law studies. To give way to his passion for the arts, he also continued art studies while pursuing law. This allowed him to develop his artistic skills and follow his father's intentions of sending him to law school. With his dedication to go to Paris, his father soon allowed the young artist to follow his dream. In 1861, Cezanne joined Zola with the hopes of pursuing art studies at the Academie des Beaux-Arts. Sadly, he was not able to make it in this school as his application was rejected. As an alternative, he attended the Academie Suisse for art studies. Throughout the artist's stay in Paris and frequent visits to the renowned Louvre for inspiration, he was overwhelmed by feelings of self-doubt. He was particularly interested in the works of Caravaggio and Diego Velázquez, yet he was not too confident about his own artistic skills. Eventually, he returned to his hometown after spending 5 months studying in Paris. He also decided to work in the banking house owned by his father. However, he still continued his art studies at the School of Design alongside his job. The artist experienced some uncertainties even if he decided that he would pursue work in the banking firm. In 1862, he went back to Paris and remained here for a little over a year. While in Paris, he met Camille Pissarro and Claude Monet. These artists also took the time to study the works of Edouard Manet and Gustave Courbet, other famous French artists during that period. 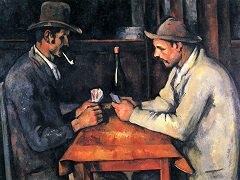 Although he was immersed with the impressive artworks of these great artists, Cezanne was not quite at ease with the lifestyle in Paris. Hence, he would go back home to Aix and pursue his craft in isolation. Aix was also considered as the artist's refuge, particularly during the time of the Franco-Prussian War. In the 1860s, the artist's works were more of peculiar and barely having much traces of his more refined and mature painting style. For instance, there were themes of melancholy in his masterpieces, and there were hints of dreams, fantasies and religious images in his paintings. While his paintings were romantic in nature, these lacked much passion and intensity. Among his paintings during this era were The Picnic and The Abduction. However, his works in the 1860s showed a hint of the artist's sense of vigor in his craft. Although his later works were more impressive, his earlier masterpieces have a spectacular depth of feeling in them. These works also reveal the artist's potentials of being a genius or a madman, yet his true personalities remained unknown to most people because the his mysterious character. Several Impressionist artists during that era including Pissarro recognized the astounding talent of this artist. He was given much encouragement by others, and he also received constructive criticisms from Zola. Yet, his works were often rejected by the Salons. This resulted to the artist's disappointment and battle with ridicule from others. In 1872, the artist decided to travel to Pontoise, in France. Here, he remained for two years as he worked with the artist named Pissarro. During his time in Pontoise, he came to realize that painting should be done straight from nature. As a result, there were evident differences in the artist's works such as the absence religious subjects and romantic themes. In addition, vibrant colors were incorporated in his paintings instead of the usual somber ambience that his artworks had. Another impact of his years of stay in Pontoise was his renewed confidence to become a part of an art exhibition in 1874. It was the artist's first time to participate in such, and this exhibition was organized by a group of radical artists whose works were frequently rejected by the Salons. The artworks exhibited were referred to as Impressionism, which became an artistic movement in the 19th century. This exhibit became the first of eight other shows that were organized from 1874 to 1886. 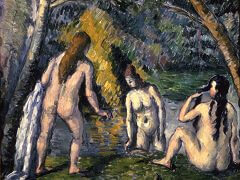 However, Cezanne decided to participate only in the first and third Impressionist show, which was in 1877. The artist soon found his own style and refrained from becoming a part of other Impressionist artists during the late 1870s. He also found contentment in working alone in Souther France, where his hometown was situated. There were some reasons behind his desire to work in isolation such as the personal direction of his artworks were not in lieu with the masterpieces of other Impressionists. Additionally, his works received negative feedback from more people. This was also the reason why he lacked the interest to exhibit his works publicly for about 20 years after his impressionist show. Camille Pissarro was one of Paul Cezanne's biggest influences and after spending time with him in 1872 Cezanne started to work outdoors with a wider range of colors. 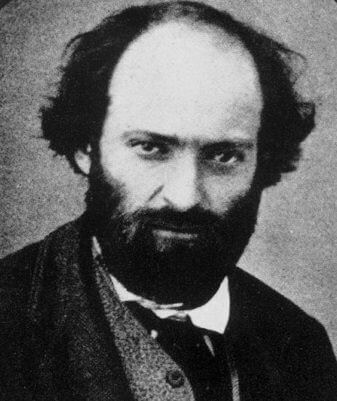 Cezanne met Vincent van Gogh around this time and was also influenced by his style. 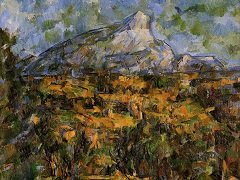 Consequently, Cezanne's brush strokes became less dense and more fluid in style. 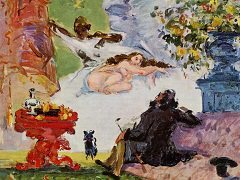 Compositions from this period clearly reveal that Cezanne's technique and subject matter was becoming Impressionistic. Among these paintings included Mont Sainte-Victoire and House of the Hanged Man, which showed some resemblance to the style of Renoir, and Monet. 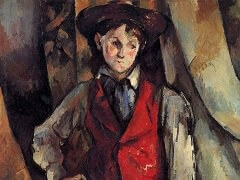 The main difference in Cezanne's artworks, though, was the lack of sensuous feel in them. It also appeared as though the artist was often attempting to add volume, color, surface and brushstroke to achieve a sense of unified entity in his masterpieces. 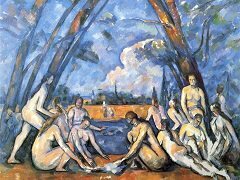 In his four decades career, Cezanne created more than 900 oil paintings and 400 watercolors, and his works influenced Pablo Picasso and Henri Matisse and paved the way for modern art.